You’ll find Miracles of God all through the Bible. And, many seem incredible. But, this Bible study lesson from Mark touches on one of the most baffling. Discover how Jesus feeds 5000 people from 5 loaves of bread and 2 fishes. See how God works in impossible situations. They all ate and were satisfied, and they picked up twelve full baskets of the broken pieces, and also of the fish. The feeding of 5,000 (men, not including women and children), is one of the most baffling miracles in the Bible. A Sunday school teacher once enlightened me to the fact that scientists and archaeologists challenge many miracles in the Bible with theory. And, if you watch TV documentaries, the shows try to “explain away” the miracles. But, this one is impossible to explain away. 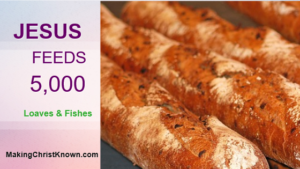 Christ created hundreds of pounds of food from 5 loaves of bread and 2 fishes? Impossible? Remember, what’s impossible to us is just another way God takes the opportunity to let us know who He is. Creating food is a simple feat for Him. Jesus referred to the crowd as sheep. And, a flock of sheep without a shepherd to guide it becomes dazed and confused. When this happens, the sheep wander into harm’s way from predators and the elements of nature. Like sheep, the crowd also needed to be guided and protected. Jesus organized them in smaller groups. Then, He took care of their physical needs by feeding them. And finally, He taught them, providing for their spiritual needs. 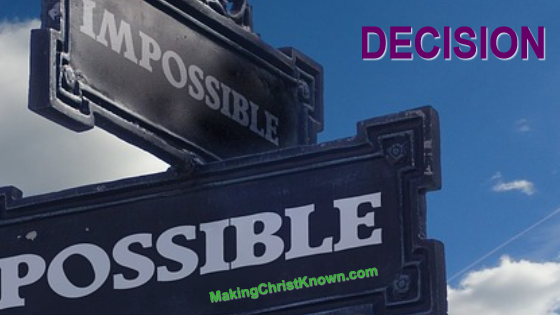 Although we cannot perform miracles as Christ did, we have a similar goal. As Christians, we receive a calling. A former pastor at our church gave a simple statement about missions. GO – Go to where people are. SERVE – Take care of their physical needs such as food, shelter, education, etc. Example: A hungry person who needs food to eat may not be interested in hearing what we have to say about salvation. SHARE – Once the first two steps are taken, we can share what we know about Christ and what He has done for us. Isn’t this a wonderful way to reach out to others? I believe this Bible lesson about the feeding of five thousand teaches us about sharing. And, it doesn’t matter how little we have. We may not have the means to reach 5,000 people at once. But, someone out there needs Christ right now. We can tell them while we serve them. If you would like to learn more about the love and life-changing experience of Jesus Christ, please take a moment to go here.